I remember turning to Kyle about a year ago in a department store and telling him that I could not believe denim skirts were coming back into style. I thought that trend would be left far behind us along with plastic choker necklaces, crimped hair and glitter eyeshadow. Honestly, I'm shocked my mother let me out of the house wearing some of the trends that were popular in the 90s and early 2000s. Then, about a month ago I saw a denim skirt online and a very small part of me felt nostalgic. 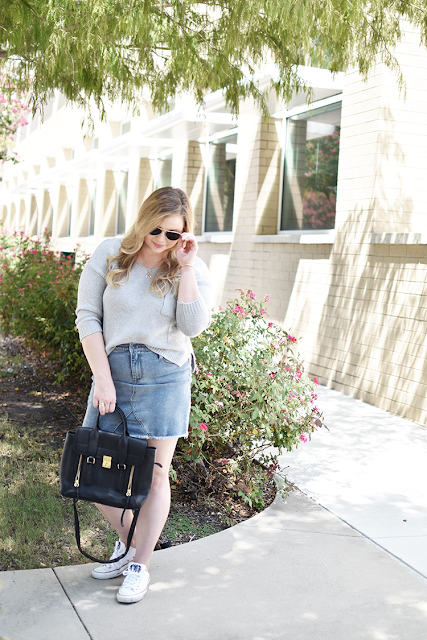 The skirt was a mid-thigh length, high-waisted and a true denim color which are really important factors in choosing a denim skirt that still feels modern. The price point was a little high for me to try a trend I wasn't sure I'd love, so I sadly closed that browser and put my nostalgic denim skirt wants aside. A few weeks later I was strolling through Target and I saw a denim skirt that was almost identical to the one I stalked online. Then I saw it's under $25 price tag and I instantly threw it in my cart. 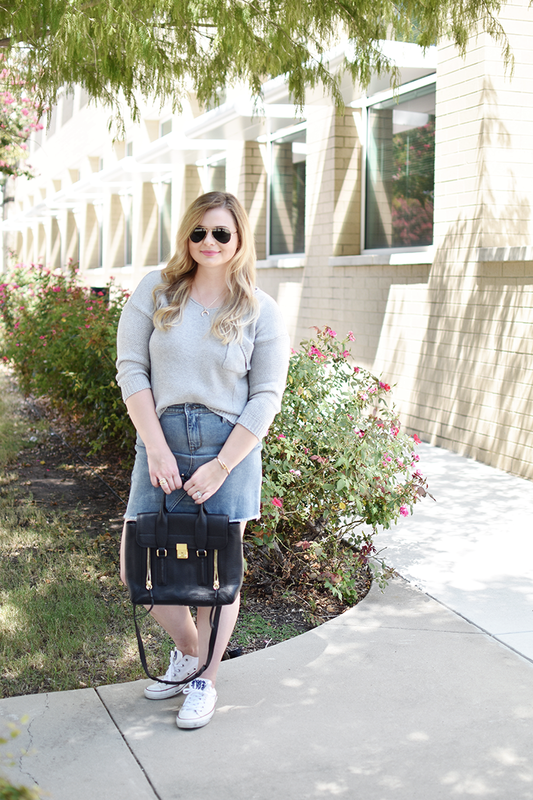 As soon as I got home I started thinking how to style it for fall and was drawn to this distressed sweater and my converse sneakers which I thought would be a great mix of old and new! 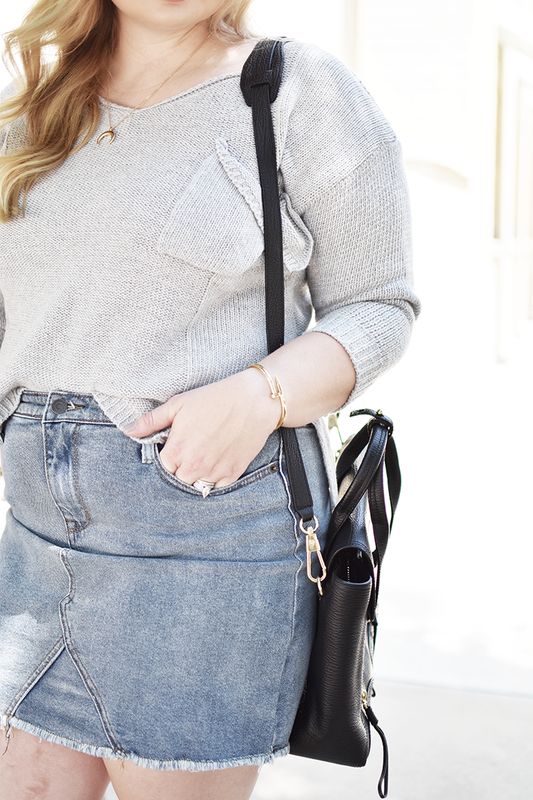 Another really important thing when styling your denim skirt is to tuck whatever top you're wearing into the front of the skirt. This lets you see your waistline, keeping you from that "boxy" look, and if your skirt has details you can see those too! 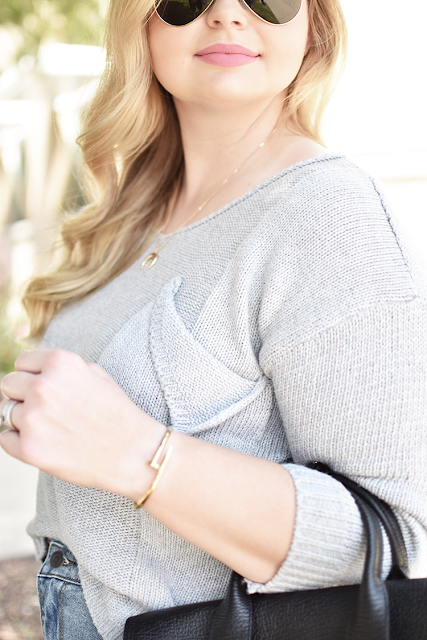 I also wanted to point out the jewelry I'm wearing in this post from Happiness Boutique! 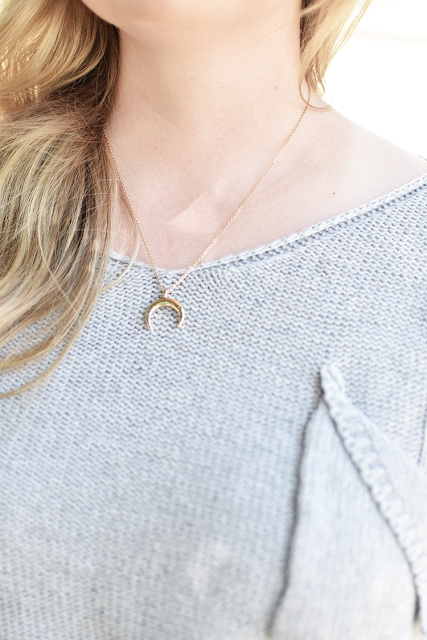 They're an online accessory retailer who carries a ton of on-trend jewelry that's also great quality. I had been wanting this half-moon necklace for a while and couldn't resist this bangle that looks great alone or with the rest of my bracelet stack! They offer free shipping and have a rewards program and for all of my readers they have generously offered 10% off with code mrsonthemove! 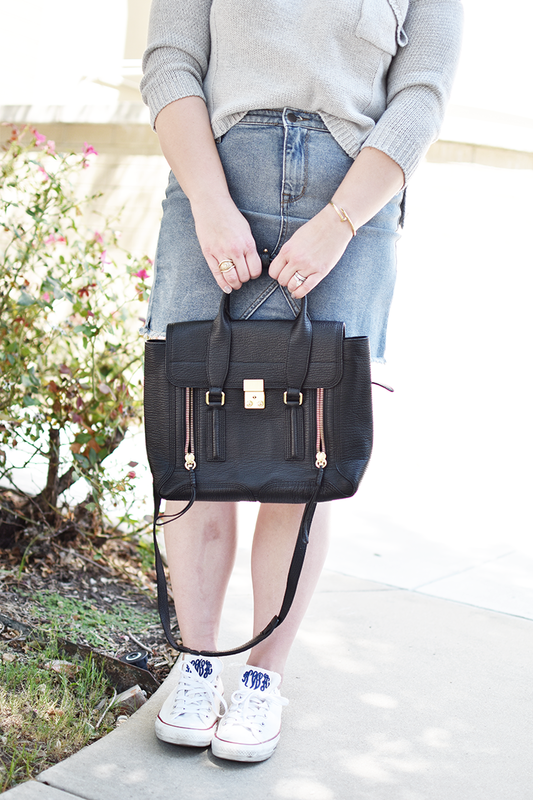 If you're feeling a little nostalgic for denim skirts I hope this post has given you a little style inspiration! Are there any trends from your childhood you're glad are back and can't wait to embrace? I'd love to hear! This post was in partnership with Romwe and Happiness Boutique.